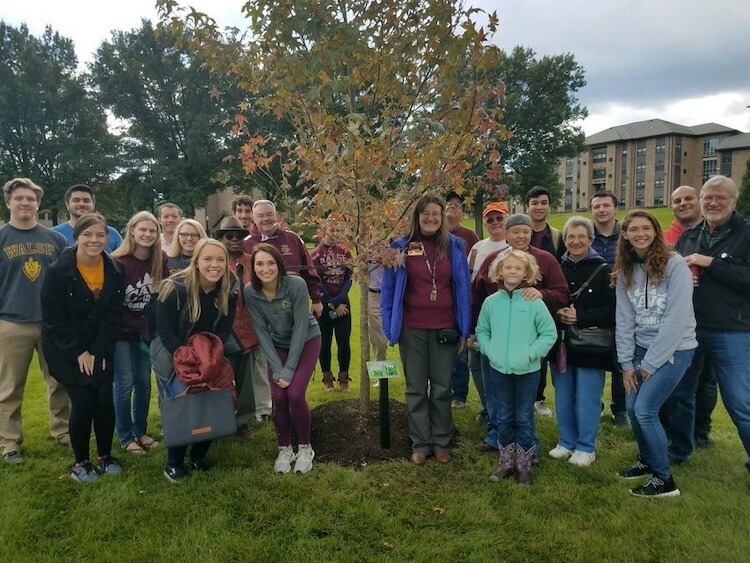 Walsh University students, faculty, staff and community gathered Saturday, October 20, for the university’s first annual Arbor Day celebration. The celebration, hosted by Walsh’s new Tree Advisory Committee, made up of faculty, staff, students and community members, was a part of the campus’ greater commitment to sustainability and trees in support of Walsh’s recognition as a Tree Campus USA school. Tree Campus USA is a program that helps colleges and universities around the country establish and sustain healthy community forests. Tree Campus USA was brought to the attention of event organizer and Professor of Biology Jennifer Clevinger, Ph.D., by senior Environmental Science major Joe Moeglin. To apply for the Tree Campus USA designation, Dr. Clevinger, Moeglin and other students, faculty, staff and members of the community have worked on an application which includes holding an annual Arbor Day Celebration, the formation of a Tree Advisory Committee, a tree care budget, a Campus Tree Care Plan and a service project. The Arbor Day celebration consisted of dedicating a newly planted sweet gum tree, displays and activities for all ages by community organizations, Walsh’s Sigma Zeta Science and Math Honors Society, the Division of Math and Sciences and the Walsh Library and a campus tree walk. The commitment to providing green space on campus and sustainable community forests provided by Tree Campus USA, echoes back to the hopes of the founding Brothers, including Brother Dacian Barrette who was known for planting trees on campus to ensure the presence of beautiful green space for students.